Why would you use crystals for healing? Because they are natural healers, just like herbs. They are not inanimate objects but very much imbued with universal intelligence and created specifically to bridge the gap between the earthly and celestial realms. Their effect is often subtle and acts first on the etheric body/aura. The most immediate and tangible effects are felt when crystals are used to soothe and calm nervous energy or anxiety. They have the ability to instantly ground this erratic energy, as well as harmonise your energy field. The other most obvious use of healing crystals is for connecting with your angels and spirit guides. Go with the crystal that calls you and meditate with it as your celestial radio transmitter! Most people and nearly all children are drawn to crystals. They have a natural pull and it just feels good holding or touching them. 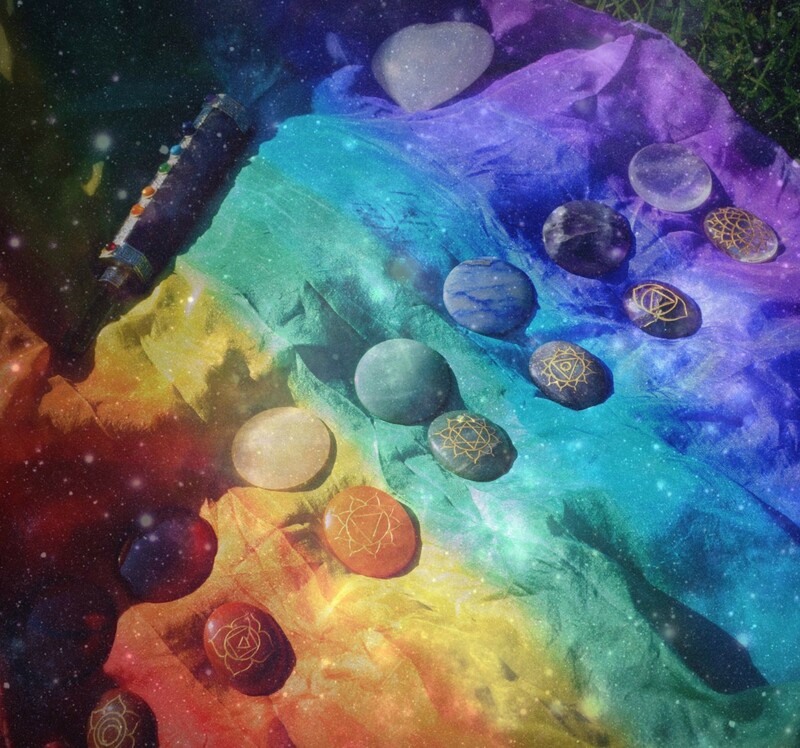 Just like you will be drawn to certain colours, you will be drawn more toward certain crystals than others. Always trust your intuition on this! #1 Amethyst – A great all-rounder that can be used to cleanse your other crystals. It purifies and transmutes negative energy. It is a great stone for meditation and has the ability to raise your vibration while keeping you grounded. It is the crystal to use for overcoming addictions of any kind. #2 Clear Quartz – Another great all-rounder. It does need to be cleansed regularly because it absorbs a lot of energy and loses its ability to transmit unless it is kept clear. It facilitates mental clarity and can be used to sweep debris from the third eye (just rub it gently over the point between and just above your eyebrows). It is the best crystal to use for amplifying healing energy during Reiki/energy healing sessions. #3 Rose Quartz – A heart chakra stone which facilitates unconditional love. Dot it around the home to diffuse and calm aggression/anxiety. Use it to heal your heart after a break-up and to manifest new love. It’s a great stone for tweens and teens who struggle with self-love, as this is the time in our development when the heart chakra opens to its full potential of unconditional love. #4 Fluorite – As most of us spend way too much time surrounded by gadgets and in front of the computer screen, we all need this wonderful crystal to keep our electromagnetic field clear and intact. Keep one or more of these crystals on your office desk. They also facilitate intellectual acuity and clear decision-making. #5 Haematite – The perfect crystal for those who struggle with staying grounded. It helps you see the most practical way forward. Use it during times when perseverance is called for. It is said to help against poor circulation in the legs and to be a ‘blood purifier.’ It is not a ‘light-hearted’ crystal so use it in moderation (trust your intuition!). #6 Green Aventurine – One of the most calming and soothing crystals you will come across. Like rose quarts, this is a heart chakra stone but here the focus is on peace and harmony rather than unconditional (self-)love. This crystal connects you with Archangel Raphael and is a great stone for healers to carry with them (or wear as jewellery) at all times. #7 Citrine – The joy stone! Citrine is said to facilitate abundance – carry a small piece in your wallet! It alleviates depressive thoughts and helps you focus more on that which brings you joy. It also enforces your personal boundaries; It is a fantastic crystal to use if you struggle with saying ‘No’ when people are demanding of your time and attention. If you are aware of boundary issues, you may want to try to meditate with a piece of citrine over your solar plexus chakra. #8 Turquoise – This crystals facilitates communication and enhances psychic ability while keeping you calm and grounded. It is a favourite of many Tarot readers who have to translate the language of symbols into something that will make sense to the client. Physically, it is said to help with any throat and upper respiratory problems. #9 Carnelian – This lovely cinnamon-coloured crystal will help you enjoy sensual pleasures. It is also said to enhance digestion and assimilation of nutrients. It has also been linked to fertility and feminine health. Carnelian promotes a sense of community, as well as truly supportive and nurturing relationships with your loved ones. #10 Black Tourmaline – This crystal is great to keep on your office desk together with fluorite. It absorbs negative energy and rebalances the electro-magnetic field. It can imbue you with a sense of personal power and has a powerfully grounding effect. It is said to help with motion sickness. If you start feeling foggy from working too long in front of your computer. Get up and walk a few paces, holding a piece of black tourmaline. This will help you ground and recharge. Love is in the Earth by Melody is a great reference book for anyone wishing to learn more about how to use crystals.